Thirteen years after its first, failed attempt to place a rover on Mars, Europe reaches a crucial stage Sunday (16 October) in a fresh quest to scour the Red Planet for signs of life, this time with Russia. Mission controllers will instruct a spacecraft about 175 million kilometres (109 million miles) from Earth to release and steer a paddling pool-sized lander towards the Red Planet’s cold, dry surface. Scheduled to arrive next Wednesday (19 October), the short-lived lander’s sole purpose is to prepare the way for a subsequent rover which will drill into Mars in search of extra-terrestrial life. “Our goal here is to prove we can get to the surface, do science, take data,” European Space Agency (ESA) science advisor Mark McCaughrean said ahead of Sunday’s lander-release manoeuvres. Dubbed Schiaparelli, the 600-kilogramme (1,300-pound) lander will separate from its mothership, the Trace Gas Orbiter (TGO), after a seven-month, 496 million-kilometre trek from Earth. 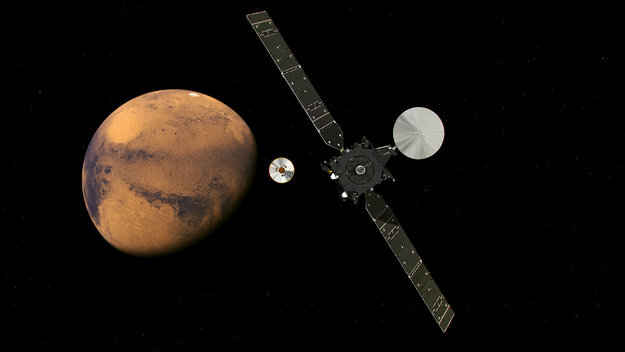 The lander and the TGO – which will enter into orbit around Mars to sniff its atmosphere for gases excreted by living organisms – comprise the first phase of the joint European-Russian ExoMars project. The second phase, due for launch in 2020 after a two-year funding delay, is the ExoMars rover, for which Schiaparelli will be testing entry and soft-landing technology. More than half of US, Russian and European attempts to land and operate craft on the Martian surface since the 1960s have failed. The last time Europe tried, the British-built Beagle 2 disappeared without a trace after separating from the Mars Express mothership in December 2003. It was finally spotted in January 2015 in a NASA picture of Mars. It showed that even though Beagle 2 failed to establish contact, it had successfully landed. The United States is alone in having successfully operated rovers on Mars. If there is life on Mars, it is unlikely to be found on the surface, which is bombarded by ultraviolet and cosmic rays. But scientists say traces of methane in Mars’ thin atmosphere may be an indicator of something stirring underground. Methane also does not survive the Sun’s ultraviolet rays for long, McCaughrean explained. One possible source is underground volcanoes. Another is life: single-celled microbes called methanogens, which on Earth live in places without oxygen such as animal stomachs, where they convert carbon dioxide into methane. It is hoped that the ExoMars rover – equipped to drill two-metres (six feet) below the surface – will yield some clues as to the provenance of Mars’ methane. In the meantime, Schiaparelli’s exploits will be crucial in designing the rover’s landing gear. The lander will separate from the TGO around 1430 GMT on Sunday, about a million kilometres from the Red Planet. It will enter the atmosphere on Wednesday at an altitude of some 121 km and a speed of nearly 21,000 km per hour. The hot and bumpy trip through Mars’ atmosphere will take six minutes. To protect the lander, an “aeroshell” will absorb and dissipate the heat generated by atmospheric drag for the first three or four minutes. When it has reached an altitude of 11 km and slowed to 1,700 km/hr, a supersonic parachute will be deployed, the ESA said. After slowing further and jettisoning its shell and parachute, Schiaparelli will activate nine speed-control thrusters. It will briefly hover at an altitude of two metres before cutting its engines and falling to the surface. The impact is meant to be absorbed by a crushable structure in the lander’s belly – similar to a car’s crumple zone. With a 10-minute delay – the time it takes for a message to reach Earth – Schiaparelli will send data on temperature, humidity, density profile and electrical properties. Battery-driven and without solar panels, the lander should last for two or three days. “Even if it does not work, we will gain a lot of information,” said Michel Denis, ExoMars flight director. After releasing Schiaparelli, the TGO will change course to avoid crashing into Mars. It will then start a 12-month process of “aerobraking” – skimming the Martian atmosphere to bleed off energy – to change its eccentric orbit into a circular one. In early 2018, it will start analysing Mars’ atmosphere from an altitude of about 400 km. If Sunday’s separation fails, mission controllers can try again on Monday.